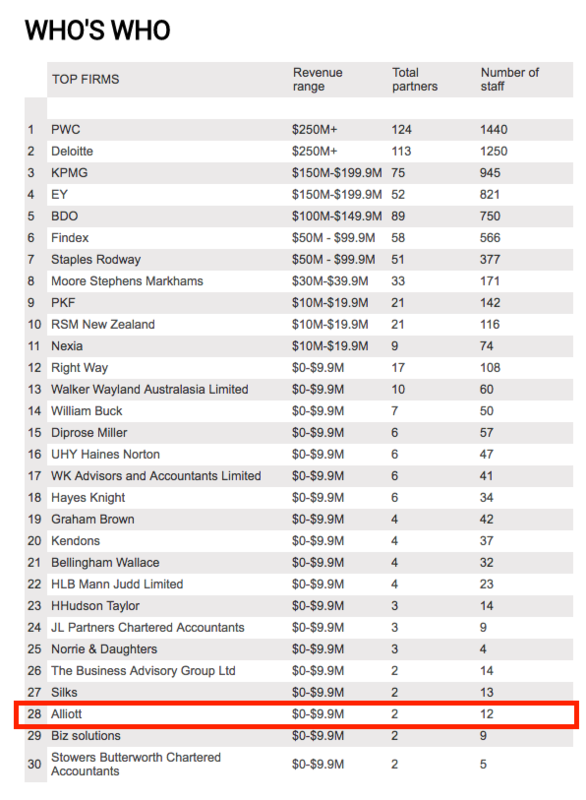 Alliott NZ named Top 30 NZ firm ?? Auckland’s Alliott NZ Chartered Accountants has been recognised as one of Chartered Accountants Australia and New Zealand’s (CAANZ) Top 30 accounting firms in New Zealand. A compilation of the country’s top accounting firms has shone a light on the contribution NZ accountants make to not only businesses, but their communities as well. Accounting firms in New Zealand were ranked for the first time and the Top 30 list was announced in Sunday Star-Times in a partnership between Fairfax Media and CAANZ. A key theme is digital change and what that means for accounting. Vial said the role of an accountant is changing and is made up of far less regulatory work and a lot more strategy and advice. The New Zealand Top 30 list will be followed by a series of other feature articles, which focus on individual firms’ efforts in areas such as innovation, business advisory and pro bono activities. CAANZ sponsored the rankings to promote the achievements of NZ firms and align with issues demonstrating performance in the accounting industry.